Former Texas Gov. James Richard “Rick” Perry has compiled a strong and generally conservative record during his long tenure in public office. As the governor of Texas from 2000 through 2014, he helped shepherd his state through a national recession and delivered economic growth. Perry is one of the most experienced 2016 candidates in terms of holding political office, with three decades in office under his belt. He announced his campaign for the GOP nomination in June 2015. While he favors low taxes and a light regulatory touch, allegations of crony capitalism are likely to be something Perry will need to address, as Texas was a major practitioner of corporate welfare under his tenure. He is a staunch social conservative and tends towards the more hawkish wing of the Republican party.. His conservative social views means he can potentially appeal to all segments of the traditional “three-legged stool” of conservatism: economy, defense, and social conservatism. Perry’s 2012 debate performances may haunt him as many voters wonder whether he has the gravitas to be president, but by most accounts he is a much improved candidate in 2016. He has given a well-regarded speech on race relations, avoided gaffes that might remind voters of his previous presidential campaign, and shown a general mastery of public policy issues. His poll numbers have put him into the bottom of the second tier of candidates, but both his campaign fundraising and that of the independent super PACs backing him have raised enough money to mount a competitive campaign. Like many of the candidates in the 2016 GOP field Perry will likely need a little help to move into the top tier, but his record and political acumen is likely to give him an edge over others hoping to go from underdog to frontrunner. Perry was born on March 4, 1950, in Paint Creek, Texas (outside of Abilene), to ranchers Joseph Ray Perry and Amelia June Holt. His father was a Democratic Haskel County commissioner and a member of the school board, and introduced Perry to politics early in life. In 1982, Perry married Anita Thigpen, with whom he had attended elementary school. They have two children, Griffin (an Eagle Scout like his father) and Sydney. After graduating from Paint Creek High School, Perry attended Texas A&M University, where he majored in animal science, graduating with a degree in 1972. A poor student, Perry was nonetheless heavily involved on campus as a member of the Corps of Cadets and as senior class social secretary. Perry got a job as a door-to-door salesman for the Southwestern Company before being commissioned in the United States Air Force and completing pilot training in 1974. He rose to the rank of captain in 1977 before joining his father farming cotton. Perry’s political career began when he was elected to the Texas House of Representatives as a Democrat. In spite of his political affiliations, he became known for favoring limited state budgets. Although he supported the candidacy of Al Gore in 1988, Perry switched parties in 1989. The next year, he reached office for the first time as a Republican, beating troubled incumbent Jim Hightower to become agriculture commissioner. This campaign was notable for employing Karl Rove as a strategist, with whom Perry would later part ways. In 1999, Perry became the state’s first Republican lieutenant governor since Reconstruction, and he assumed the governorship in 2000 when George W. Bush left the office to become president. He went on to be elected in 2002 by a substantial margin, and was again elected in 2006 and 2010, each time by comfortable margins, making him the first governor elected to three four-year terms. 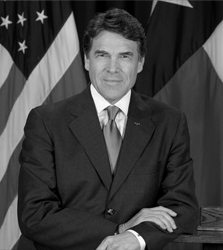 In 2011, Perry was a relatively late entry into the race for the Republican nomination for president. While he gained momentum in the early going, poor debate performances and controversy eventually wore down his campaign, and he eventually endorsed Mitt Romney after briefly supporting Newt Gingrich. In 2014, Perry chose not to seek re-election as governor. While Perry signed a resolution in support of state rights under the 10th Amendment, he was notably successful in obtaining federal dollars for Texas. Broadly, outside of social issues, there are open questions as to what Perry believes the proper role of government is in terms of spending and taxation. Perry has taken stands that are opposed by many in his party, such as favoring in-state college tuition for illegal aliens.7 While unpopular with the conservative base, it does show his willingness to put principles before politics. According to one Texas media outlet’s accounting, Perry managed to keep 41 percent of his campaign promises, while 31 percent were listed as “promise broken.”8 The remaining promises he either compromised on or were listed as either “in the works” or not rated. Many of those listed as “promise broken” were areas where Perry proposed legislation to fulfill his promise, but the legislature failed to pass his proposal. While he is famous for a couple of key gaffes, and is often painted as a Southern rube by opponents, Perry is a remarkably confident and assured speaker. His speech at the 2014 Conservative Political Action Conference (CPAC) drew raves from attendees. He works hard to address areas of weakness and has spent months prepping to improve upon his poor debate performances in the 2012 nomination contest. He has generally fared well on the campaign trail so far, giving a well-regarded speech on race relations and performing well in interviews.9 He has authored two books, On My Honor: Why the American Values of the Boy Scouts are Worth Fighting For and Fed Up! Our Fight to Save America from Washington, both of which argue for a return to conservative values and limited government. Perry’s economic record is likely to be one of his most valuable assets on the campaign trail. During his governorship Texas’ job growth led the nation, an achievement that is sure to be touted often during the 2016 nomination contest. As the governor of a state firmly in Republican hands, Perry has had little need to forge bipartisan compromises with Democrats. But his own history as a Democratic state legislator in the 1980s and a strong record of getting his economic agenda implemented in Texas suggests good political skills and an ability to create coalitions to support his preferred policies. Throughout Perry’s lengthy tenure as governor, Texas has maintained relatively low taxes with relatively few regulations. He has cut property, sales and payroll taxes while resisting the creation of a state income tax.11 This has attracted a number of businesses to the state from high-tax, high-regulation states like California. This isn’t to say Perry is pristine on the issue of raising taxes. In 1987, as a state legislator (albeit as a Democrat), he voted for the largest tax increase in the history of Texas. After switching parties to become a Republican, in 1990 Perry voted for a $500 million tax increase. Also, as is true of many state leaders, Perry has signed or voted for a number of fee increases. Perry has made extensive use of business incentives and subsidies in order to lure business to Texas or support industries and companies he views as important to the state economy. Two incentive programs, the Texas Enterprise Fund and the Texas Emerging Technology Fund, were created while Perry was governor and have showered hundreds of millions of dollars on corporations.23 Free-market advocates almost universally oppose these sorts of programs as wasteful, ineffective, and prone to corruption and political favoritism. Perry is an outspoken proponent of bold entitlement reform. In addition to standard-issue conservative positions on allowing younger people to utilize personal retirement accounts if they choose, Perry has recommended allowing states to opt out of Social Security entirely. Further, he has said that Medicare should be a state program free of any requirement from the federal government.31 He has favored drug screening for welfare recipients and restrictions on welfare benefits being used to purchase alcohol, cigarettes, lottery tickets or adult entertainment, among other things. At a March 2015 event in Iowa, Perry explained his opposition to the Renewable Fuel Standard (RFS), a mandate requiring fuel refiners to include ethanol in gasoline, saying he didn’t believe the federal government should be dictating the issue.44 As governor he requested a waiver from the federal government for the RFS. A former Air Force pilot, Perry has flown in Latin America, North Africa and Europe. Since his unsuccessful 2012 bid, Perry has traveled to Britain and Israel and consulted with conservative academics on international policy. However, his experience remains limited by the scope of the positions he has held. “[S]ome hold this worldview that government must be central in our – in our lives and serve as our caretaker. They seek more than equal opportunity, they seek equal outcomes. And you know, those in the White House today don’t believe – they don’t believe in American exceptionalism. They’d rather emulate the failed policies of Europe.… American exceptionalism is the product of unlimited freedom. And there is nothing troubling our nation today that cannot be solved by the rebirth of freedom – nothing. Perry’s real-estate dealings have earned the scrutiny of opposing campaigns. However, no concrete evidence of wrongdoing has emerged, and Perry has put his wealth into blind trusts, which now provide most of his income.94 Absent hard facts, it seems unlikely any of these accusations will have legs. Perry’s business development and incentive programs are likely to draw scrutiny, as are his appointments of top donors to key positions. In both cases it will be charged that Perry used his power to reward insiders and cronies. More troubling for Perry is his lack of national donor support and the perception of a rift between him and key Bush allies. This could make fundraising and recruiting top-tier talent for a run more difficult. He is occasionally gaffe-prone: During an early Republican debate during the 2012 nomination process he famously forgot which federal departments he would eliminate if elected president.